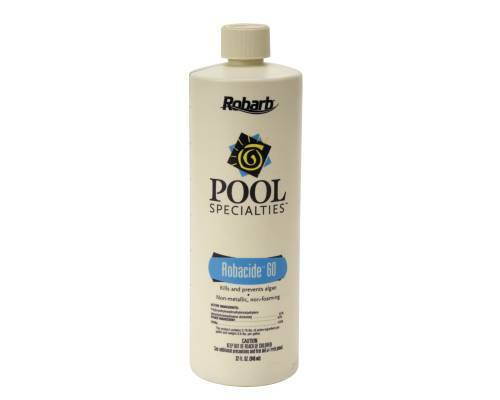 Robarb -- Non-Foaming Poly-Quat Algaecide Controls and Prevents Green, Black and Mustard/Yellow Algae. Excellent For Pool Openings and Closings. Applied Biochemists -- Multi-Purpose 2% Copper Algaecide. Non-Foaming. No Waiting To Swim. 32 Oz. Packed 12 Per Case, Sold Each. Robarb -- Concentrated Ammonium Quat Algaecide Prevents and Kills Green and Blue/Green Algae. Treats Ups To 60,000 Gallons Of Pool Water. 50% Ammonium Quat. 32 Oz. Packed 12 Per Case, Sold Each.